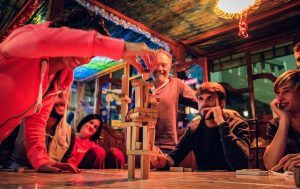 Dynamic Loisirs Surf Camp cultivates the art of friendship, warmth and Traditional Moroccan cuisine.. you will discover the cooking of Chef Fatima, known and recognized by surfers worldwide as the best chef in Morocco! Our Surf Camp accommodation has 11 rooms split up into two traditional Moroccan houses. Two have ensuite bathrooms, the rest have the use of 4 other bathrooms, all with hot water for showers. 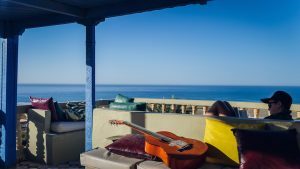 The top level of of the Surf Camp has a beautiful terrace where you can see up to Taghazout, check the surf, sunbathe, play pool and socialise. Storage of equipment for surfers. All rooms in the main house have reversable air conditioners. Many accommodation types possible: double room with breakfast, possibility of 1/2 board or full board. Bigger bedrooms to share for 3 to 5 persons also with breakfast, 1/2 or full board. TV with DVD, chill out area on the terrace for your evenings, WIFI access free of charge, computer with internet to check the swell, storage for your boards, special area for rinsing your wetsuits. 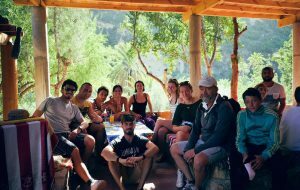 Our Surf Camp is situated just 13 km North of Agadir, and 5km (5mins) South of Taghazout, Morocco. 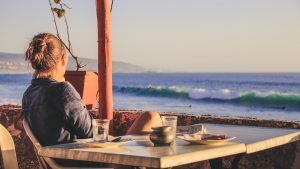 The Surf Camp is well known by surfers around the world given our great geographical location (panoramic views overlooking Taghazout and the best surf spots in Morocco). A quick look from our terrace will indicate the surf spot of the day.